Come discover the magic of maples! 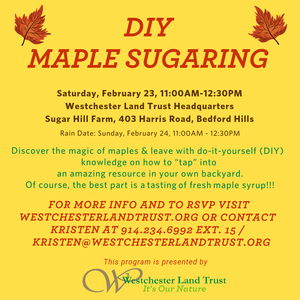 Join us for this hands-on, family program where we will discover how to identify a maple tree, tap it and then detail the process of making syrup. There will be history, storytelling, science, and sap tasting– something for everybody! Come explore a tradition and leave with DIY knowledge on how to “tap” into an amazing resource in your own backyard. This program will be indoors and outdoors. You can’t have maple syrup without cold weather so come prepared with warm clothing! Click here to learn more and RSVP.